More than 10,000 firefighters battled wildfires Monday from California's Central Coast to Sierra Nevada forests or mopped up remnants of destructive blazes beaten into submission up and down the state. Cal Fire says about 1,900 structures were threatened by the 33,000-acre blaze Chimney Fire in coastal San Luis Obispo County, where more than 2,400 people were under evacuation orders. Cal Fire strike teams moved quickly to contain and douse a brush fire in Butte County yesterday evening. Firefighting aircraft were quickly dispatched against the Wyandotte fire near Oroville. The fire, in the Palermo area, was held at a mere five acres. Another fire, also first reported yesterday evening near Beale Air Force Base in Yuba County, was declared fully contained this morning. The fire, off of Hammonton-Smartsville Road, consumed 400 acres of grass and brush. Updated Thursday, Aug. 18, at 10:20 a.m.
Cal Fire is reporting that 316 homes and other structures remain threatened by the Clayton Fire, burning near Clear Lake. The fire, first reported Saturday, has burned through nearly 4,000 acres. Close to 2,100 firefighters are on the scene, backed by 200 engines and a dozen firefighting helicopters. The fire has destroyed 175 homes and 93 garages, sheds, commercial buildings and other structures. Some evacuation orders related to the blaze have been lifted. The fire is 55 percent contained. Authorities say a 40-year-old man has been arrested on suspicion of starting the blaze that destroyed more than 175 homes, business and other structures in Lake County community. Lake County Sheriff Brian Martin said Damin Anthony Pashilk of Clearlake, California was arrested yesterday on 17 counts of arson and is in jail. Cal Fire Director Ken Pimlott says the blaze has caused over $10 million in damages and left dozens of families homeless. Cal Fire is reporting that the Canyon Fire near Lower Lake in Lake County was declared fully contained late yesterday. The fire, off of State Highway 29, was held to 14 acres. The nearby Kugelman Fire, also near Lower Lake and State Highway 53, is also 100 percent contained at 45 acres. The Cold Fire burning between Winters and Lake Berryessa is now 99 percent contained. The fire has burnt more than 5,730 acres. Cal Fire says the Mountain Fire, which broke out Tuesday afternoon near Keswick in Shasta County, is now 80 percent contained. 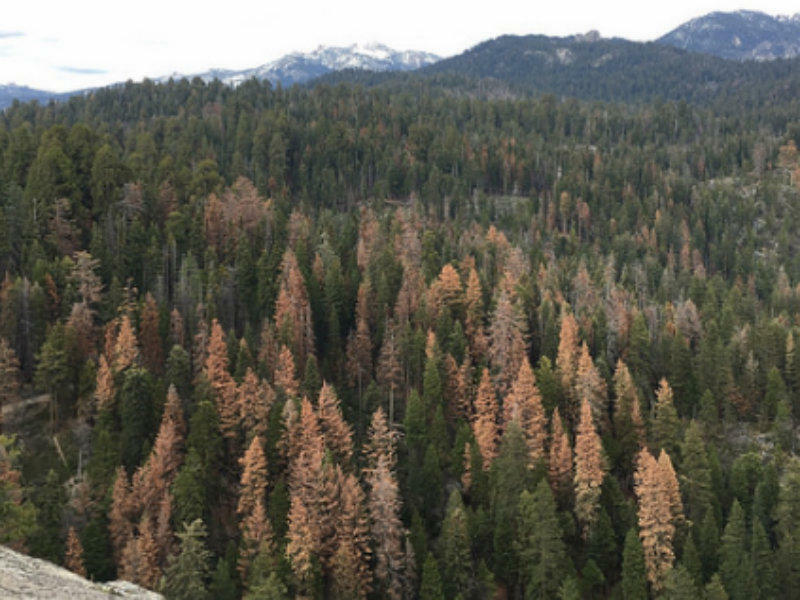 In June 2016 the U.S. Forest Service said it identified an additional 26 million dead trees in six southern Sierra Nevada counties, bringing the total to 66 million dead trees statewide. Aerial survey photo in Sequoia National Forest taken May 2016. Updated Friday, Aug. 5, 2016, at 3:04 p.m.
A three-day old wildfire burning in the rugged hills between Winters and Lake Berryessa in Yolo County continues growing. The U.S. Forest Service is now leading the battle against the 4,700-acre blaze, replacing Cal Fire. The fire jumped a containment line Thursday, and continues burning westward, into Napa County and toward the lake. Update August 3, 9:20 a.m. The 99 Fire, which burned 550 acres south of Chico Tuesday afternoon, was declared 100 percent contained by Cal Fire as of Wednesday morning. Update August 2, 5:03 p.m.
Air tankers are making drops on a wildfire in Butte County sparked by a vehicle accident. The fire exploded Tuesday afternoon to 550 acres over the course of two and a half hours. Authorities have apparently stopped the fire’s spread, at least for now. The forest fire burning up the Big Sur coast has destroyed 57 homes according to Cal-Fire, which has expanded evacuations in the area. The Soberanes fire has reached 40,000 acres in size and is considered 18 percent contained. One person, a bulldozer operator, has been killed. Two thousand homes remain threatened, and more than 5,000 firefighters are battling the blaze. An 1,800-acre wildfire burning near Fresno is threatening 400 structures. Evacuation orders remain in place as the blaze continues moving in a southeasterly direction. More than 1,300 firefighters are on scene.